These have been cropping for nearly a month now and still have new beans forming. 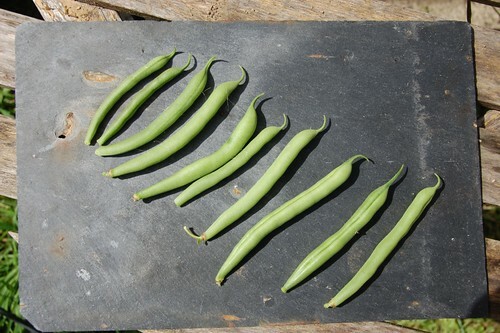 They are delicious when picked small but even the larger, goutier bean remain stringless which makes them useful at all stages. Cream/orange flower buds opening to white flowers. It's worth picking this old heritage variety regularly as the older pods do form irritating strings. If you get the pods young they have a marvellous flavour and texture that I find particularly good in salads. The older pods are still very edible if you take the time to string them, and it's not a difficult task. Cream/orange flower buds opening to white flowers. 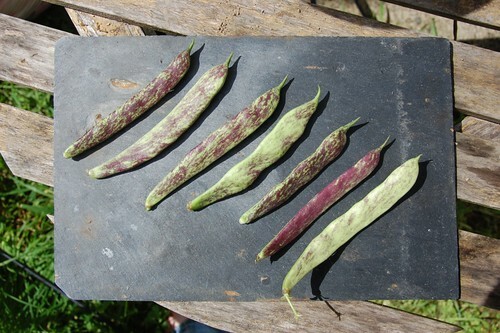 I was quite sniffy about these beans which I received from HSL but they are healthy vigorous growers and setting a lot of very tender flat pods, attractively mottled with red. I've yet to see if the dried beans are going to be of any use in the kitchen but these are worth a trial to see if they suit your garden conditions and palate. Small mauve flowers. I still don't know what these beans are called as a variety. I've been calling them after their donor, Riana, but I'm sure they must be a named sort. 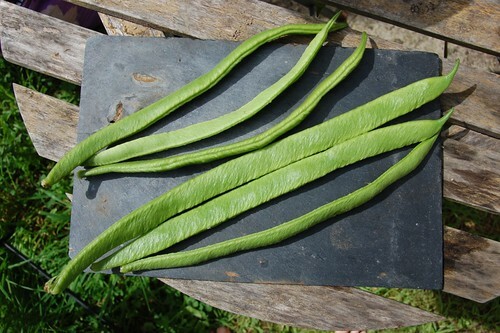 Excellent long stringless beans that thrive in hot dry conditions. The flower buds are the creamy orange sort opening to white flowers and the bean seed are narrow ovals of brown/black colour. This is another heritage variety which I think originated in Australia. 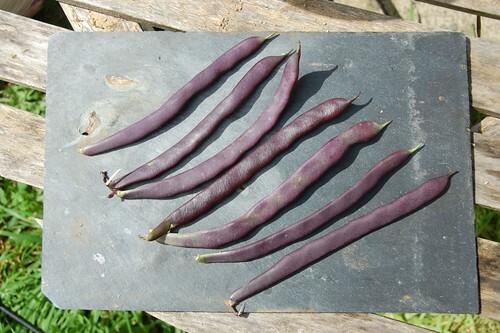 The plants are strong growing and beautifully flushed with purple and the beans (at least when young) are smooth and tender although, as with all coloured beans, the beautiful colour is lost during cooking. If I have a reservation about this variety it is that all the pods seem to mature at the same time or within a very short period which makes me wonder if this was developed more for the commercial grower than the home gardener. 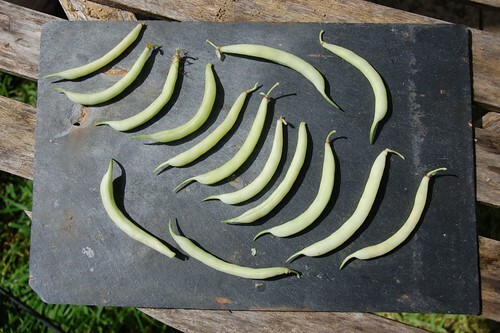 Still, it makes a good shelling bean before the seeds dry hard. Purple flowers held high. 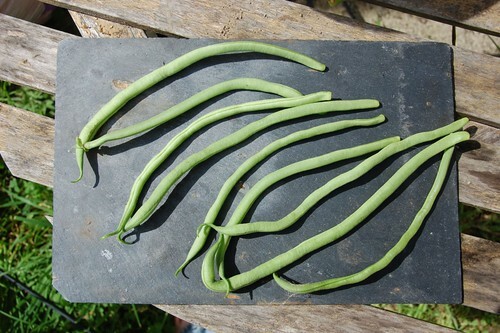 The only runner bean I'm growing this year, it's an old favourite. The pods are rather rough but with excellent flavour. Pick them young and you won't be disappointed. The flowers are white and so are the seed, not quite as big as the seed of the White Spanish but still usable and a more garden worthy plant altogether.